We were pleased to welcome as our guest speaker Mark Gibbons to talk to us about "Valles Marineris", which is a huge canyon system on Mars that dwarfs the North American Grand Canyon. Mr Gibbons is an active member of Cotswold Astronomical Society and helps to organise their events and speakers. He began by saying that Valles Marineris (Mariner Valley) was discovered by the Mariner 9 spacecraft in 1972, which was the first probe to orbit another planet. This NASA spacecraft mapped 85% of the Martian surface, taking over 7,000 images which included pictures of the largest volcano in the Solar System (Olympus Mons), Mariner Valley as well as the Martian moons Phobos and Deimos. Mariner 9 arrived at Mars on November 14th 1971 narrowly beating the Soviet spacecraft Mars 2 and Mars 3 to Mars. Unfortunately, they had all arrived when Mars was totally covered in a global dust storm obscuring the surface. This severely degraded the images from the Soviet probes but luckily NASA could reprogramme Mariner 9 to delay its imaging mission until the dust had cleared from the atmosphere. Mariner 9 ran out of fuel in October 1972 and is still in orbit around the planet. It is expected to remain in orbit until 2022, when it may enter the atmosphere and either burn up or crash into the surface. Mr Gibbons then gave a more detailed description of the Mariner Valley. He explained that it is a vast canyon stretching 4,000 km across the equator of Mars and in places it is 7 km deep, spanning about 20% of the entire distance around the Martian equator. This means it is roughly 10 times as long and 4 times as deep Earth's Grand Canyon. If it were overlaid on a map of North American, Mariner Valley would stretch from the east to west coasts. 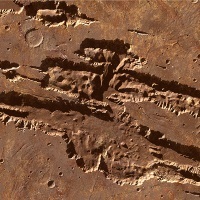 Using data gathered from Mariner 9 and subsequent spacecraft, scientists propose that Valles Marineris is a large crack in the Martian crust due to a combination of parts of the Martian crust cooling and shrinking and other parts rising due to volcanic activity. The area that rose is to the west of Mariner Valley and is named the Tharsis Region, a vast volcanic plateau with the largest volcanoes in the Solar System — Olympus Mons, Arsia Mons, Pavonis Mons and Ascraeus Mons. It is thought that these volcanoes formed over a hot spot in the Martian mantle and as Mars lacked the crustal motions we see on Earth the volcanoes grew to great heights. In contrast, to the east of Mariner Valley is what appears to be large outflow channels, which may at one time have emptied into a large ocean that covered the northern hemisphere of Mars in the distant past. This low-lying eastern area is termed "chaotic terrain" by geologists and they think that it formed when huge amounts of subsurface water became pressurised by volcanic activity. The water would then have forced its way through cracks and faults in the crust and flooded out into the Valley. Mr Gibbons ended his talk by saying that many geologists would love to send spacecraft to explore the whole stretch of Mariner Valley. However, due to the extreme terrain it would be very difficult to land any probes safely on the surface.